Condomínio Penthouse Hilltop com Breath-Taking Oracle Views !! Um condomínio penthouse no topo da colina que oferece vistas panorâmicas únicas sobre o Golfo do Corinto e o vale Olive Tree da Delphi Oracle! Espaçoso e confortável, oferecendo 2 quartos duplos, sala de estar, lareira, cozinha totalmente equipada com banheiros e banheiro com novos aparelhos. A varanda oferece vistas magníficas sobre o vale mais importante e inspirador da Grécia antiga. O condomínio será a sua base ideal para explorar Delphi e cidades pitorescas Arachova, Galaxidi, Itea! Very good and instant communication with Paris and greeted by his wonderful mom. We loved the place and only regret that we could not stay longer. Highly recommend this place due to the fantastic view, closed to downtown Delphi and plenty of room in this very nice apartment. property had everything we needed (even goodies for breakfast) and very helpful owner downstairs . 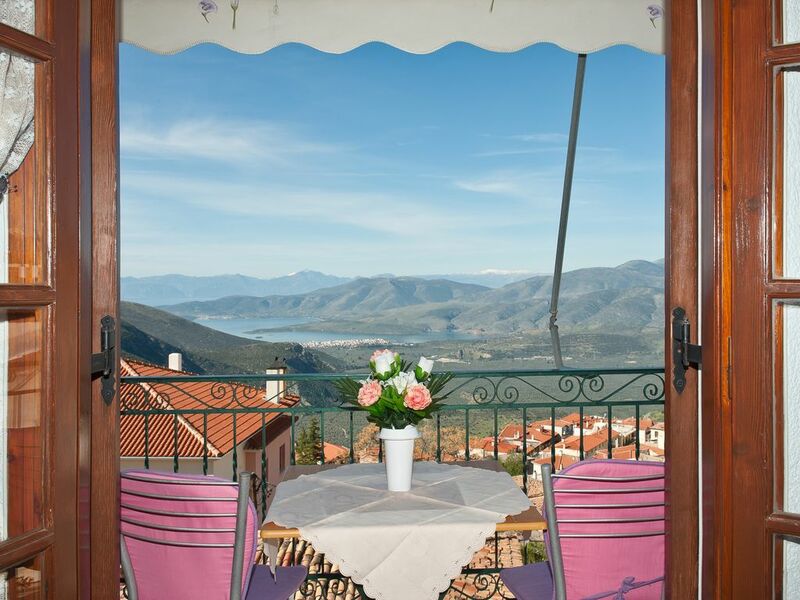 can't imagine better place to enjoy Delphi's views, history, and shopping. Sehr schöne Wohnung. Sehr netter und unkomplizierter Vermieter. Der Blick vom Balkon ist wunderschön! This is a great place to stay in Delphi. Very quiet and very high. Parking is outside on the street. Big sitting room/kitchen/diner. Spacious apartment with spectacular views. After a welcome from our hosts, we immediately felt at peace and able to relax in this spacious top floor apartment in a three storey house. The views are of course spectacular. The streets are narrow, but we found there was always parking available. Delphi is a hill town: there are steps down to the main streets and up to the house, but Ancient Delphi is within easy walking distance. Paris gave us a number of recommendations for day trips, which are all worthwhile and not to be missed. He also gave us recommendations for restaurants in Delphi itself. Everything we needed was provided in the apartment. We stayed in Delphi at Paris's Hilltop Penthouse for only 1 night in June 2017 and wish we had booked another night! It truly has breathtaking views from the balcony, front room, and bedrooms. It is located out of the way in a cute local neighborhood which is a short walk to the market and main street with restaurants, shops, etc. The short walk consists of many stairs, so if that is an obstacle for you, you may want to purchase groceries on the way and cook at the condo. I don't know about parking since we did not have a car. A laundry machine is in the bathroom, which we were able to use and air dry our clothes. We received a wonderful friendly greeting from Paris's mom and later an enthusiastic one from his dad, it made us feel like family coming to visit! We would highly recommend a stay here at Hilltop condo in Delphi! Theresa, thank you for your kind words and we are very glad you enjoyed the experience! Looking forward to hosting you in the future - for a bit more next time!